Is strict observance of the Constitution unjust? Modern American society has seen a sharp divide in the legal interpretations of the U.S. Constitution. Issues ranging from communication, women’s rights, firearms, racial and class inequity, and the relation of corporate finance and politics were decided in the Supreme Court by examining the issues being litigated against our founding document. There is no doubt that the rights and protections granted by the Constitution were a revolutionary reimagining of what societies would like, but do we as people do justice to our society by strictly observing a document created in 1787 by a collection of elites? Founder Thomas Jefferson was evident with his intention that constitutional rigidity created a systemic issue of unfairness towards future generations. As an original author, Jefferson understood the inherent dilemma and significant negative ramifications of having new generations bound to the laws of their ancestors. However, many relevant and recent legislative issues subjected current generations to the writings of the founders. 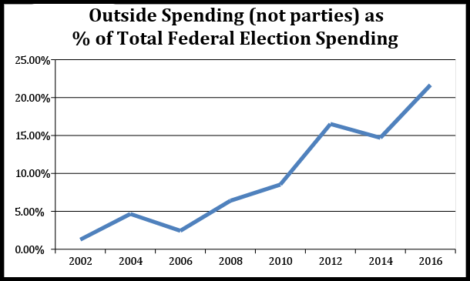 The best example of such a ruling is one that permeates all aspects of political and social life – campaign financing. Despite data showing clear majorities1 in both political parties’ desire for limits on campaign spending, the Supreme Court used the First Amendment to justify unrestricted political funding for-profit corporations. According to PublicIntegrity.org2, “The ruling declared that spending is speech and is therefore protected by the Constitution.” The results of this have led to more than 20% of all campaign finance funding3 originating from private organizations which are not obligated to disclose their donations. Citizens United is something we were all subjected to despite majority opposition, and many of us would imagine that in a legal challenge the potential negative ramifications of such a decision would be weighted above strict adherence to a centuries-old document. It is unlikely that the Founding Fathers could have conceived of the level of social and political connectivity we would have today and how significant private investment could skew public perception. Citizens United is an example of an injustice laid upon the American people based on the writings of individuals who have been dead for 198 years. While the founders of the U.S. Constitution were revolutionary thinkers for their time, it is illogical to tie ultimate legal precedence to the strict and legal interpretation of their document. They understood this, yet some in our modern society do not. By allowing conservative legal judgments based on literal interpretations of the Constitution, we restrict the society and citizens of the present and future to be subject to the whims of the dead. That is an injustice that will need to be rectified through the reformation of our legal structure to better prepare Americans for the coming technology-driven transition.